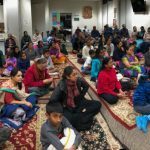 Categories: Bhakti, Divine Names, Sri Swamiji's Kirtans. 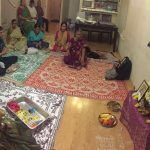 Sri Ramanujamji conducted a satsang at the residence of Sri.Balaji and Mrs.Nandini Balaji on Sunday, October 7th 2012 from 11am to 12:30pm in Atlanta . 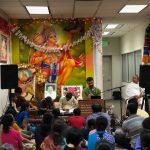 Sri Ramanujamji delivered a lecture in Tamil with reference to eleventh canto of Srimad Bhagavatam. He began the lecture with a prelude to NavaYogi Upakyana and then explicated on Kavi Yogishwara’s exposition of Bhagavatha Dharma. 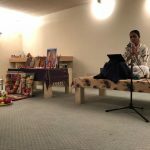 He then talked about how the path of bhakti is a means to overcome fear and the importance of developing divine love for the lord. A spellbound audience listened with awe and reverence. 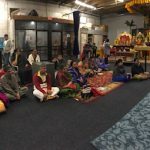 About sixty people attended the satsang. 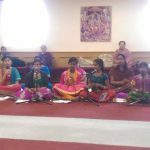 The satsang concluded with the rendition of Mahamantra.